I've created a downloadable file for making compliment bunting. When you need to tell someone they're super, this might be just the thing. Use it for birthdays, promotions or when your friend is sad. Everybody likes compliments. By the way, your hair looks very nice today. Or just print your favorite PDF pages on cardstock and cut them out. Punch small holes in the corners and string the bunting. The PDF contains six pages—three designs in two colors each. 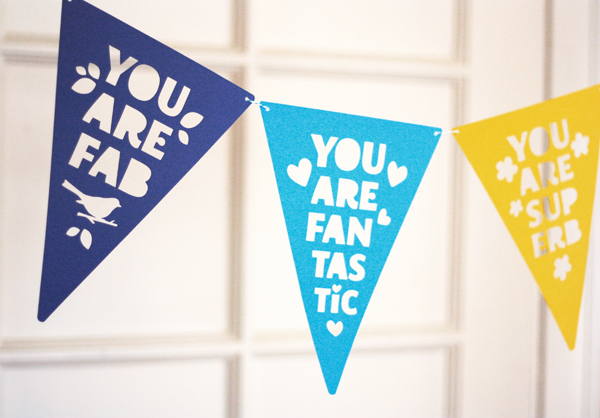 Download the complimentary compliment bunting file right here. This has Berna written all over it. This is a really cute idea. Thanks for sharing! TNS: I know. She was my muse. Love it! I'm going to use it this weekend! Any tips on putting it together once it's printed? It looks like there's a little space between each triangle - are there knots behind there somewhere? Thanks! Ha - my blog post was about feeling less than enthusiastic about my hair and just having a bad day . . . very funny to write that and then read your post IMMEDIATELY after. :) Thanks! Why, thank you! And here I thought I was having a BAD hair day! Hey there, Sara. No knots—I just threaded the string in and out of the holes. The string goes behind each triangle. This is fantastic, just what i needed! Thanks a bunch! this is darling! i love it. thank you! What a great idea! Thank you so much for developing and sharing it. I will have to run and buy some stronger paper to print it out for my friend's birthday next week! Thanks for this! A lovely idea. Thank you so much for this post. I want to let you know that I posted a link to your blog in CBH Digital Scrapbooking Freebies, under the Page 4 post on Apr. 06, 2011. Thanks again. thank you ... this is just what i needed to pick me up ... you rock!! really cure :) what font is that? A friend and I really needed some positive affirmations, and here they are!!! thank you! they are printing right now! Love this tutorial. Have just bought a Silhouette machine so this will be my first project. Have posted about your tutorial on my blog, hope you don't mind, but I love all the paper craft projects you do. Or a banner that proclaims that you are fully and completely and joyously you and that is completely and wonderfully just enough. (patting hair) Thanks! I like your shirt. Larissa, thanks! This is my favorite shirt. Anonymous, the font is MEgalopolis Extra, available free right here. I doctored it up in a couple places and knocked out the counters (holes in the letters). You always have such great ideas! Thank you for this. I'm making them for my kids. They'll love it. any suggestions for making this without the equipment reccomended?? Cut the letters painstakingly by hand with an X-acto knife, or just print the colored pages, trim out the triangles with a scissors, and call it a day. love it! some encouragement during a dreary day. That's just wonderful. Thank you so much. Love it! I'm going to hang one up in the staff room at my kids' school for Teacher Appreciation Week. You are fab for sharing these! Thanks & I have featured them in my cinco de mayo round up! This is great! Thank you! Best regards! I used this for a subtle backdrop at a baby shower I hosted last weekend, and now it's hanging in my daughter's room. Thanks for sharing it! 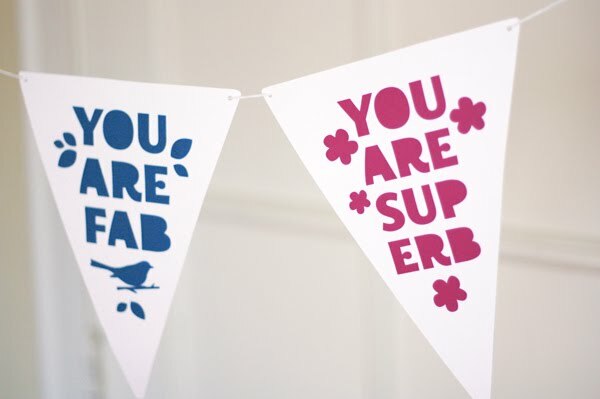 Thank you for sharing this lovely bunting Jess. Would you mind if I pinned it on my board on Pinterest? (And any other sweet things from your blog). I will pin back to the original post. I shared where I got the idea from and linked to your post so my readers could print out your downloadable file. Thanks so much for that!! Yours looks sweet, Su! Love the rainbow effect! Thanks for this. Perfect for friends right now. They look really good! Thanks!